This will be short and sweet, I promise – who wants to sit inside reading on a screen when the unofficial end of summer is but a few short hours away? It just came back from being framed this week, and did they ever do a fantastic job. The mattes she picked out complement the colours so perfectly! Have a wonderful holiday Monday, everyone! 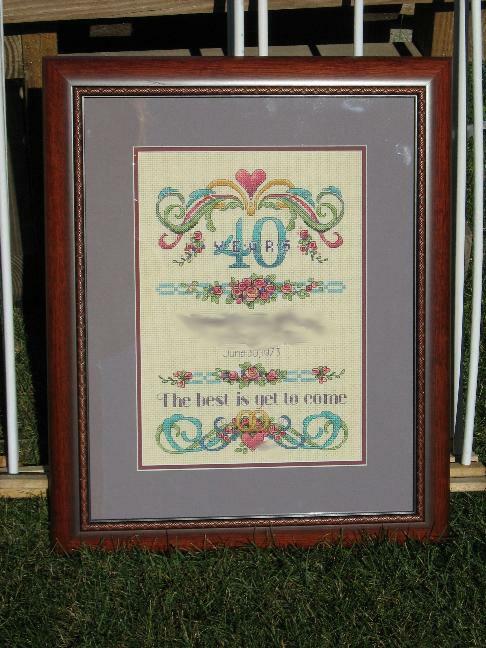 Okay, so….the anniversary gift I was stitching for my parents was just a wee bit late, say, a week and a half or so. (But don’t worry, I’m not some slacker child; I did buy them dinner to celebrate.) So yes, first I was late getting it to them, and now I’m horribly late in posting it, but better late than never, right? It’s a Solo the Cat pattern by Anchor, found in an old issue of The World of Cross Stitching, and stitched with much cursing of backstitch. This would definitely have been easier on evenweave. It hasn’t been washed or framed yet, but that will come…in time. I had picked Solo because he bears a slight resemblance to one of our cats (very slight – as in, they both have darker markings on a light body, but that’s about it); upon presenting it to them, I realized that I had also done pieces for them in 2004 and 2008 with cuddling cats. I think I detect a trend. In other news, the birth announcement I’m working on is almost, almost finished, although I won’t be seeing the new mother for a while, so time is not necessarily of the essence. 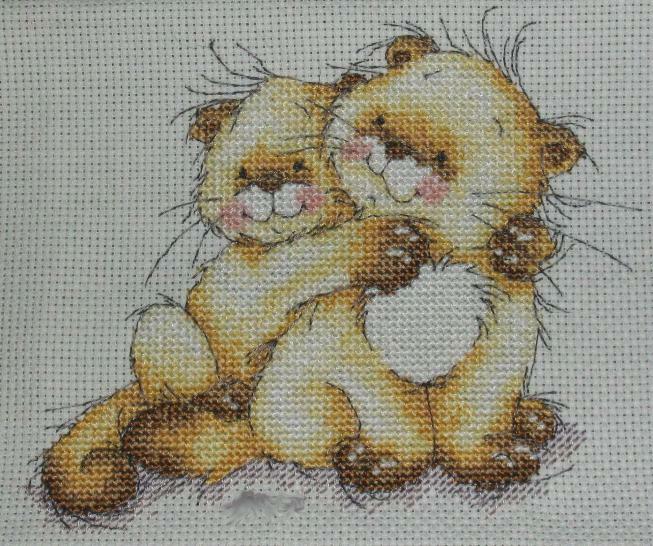 And I just received a few new Mill Hill beaded Christmas kits in the mail the other day, so stay tuned….